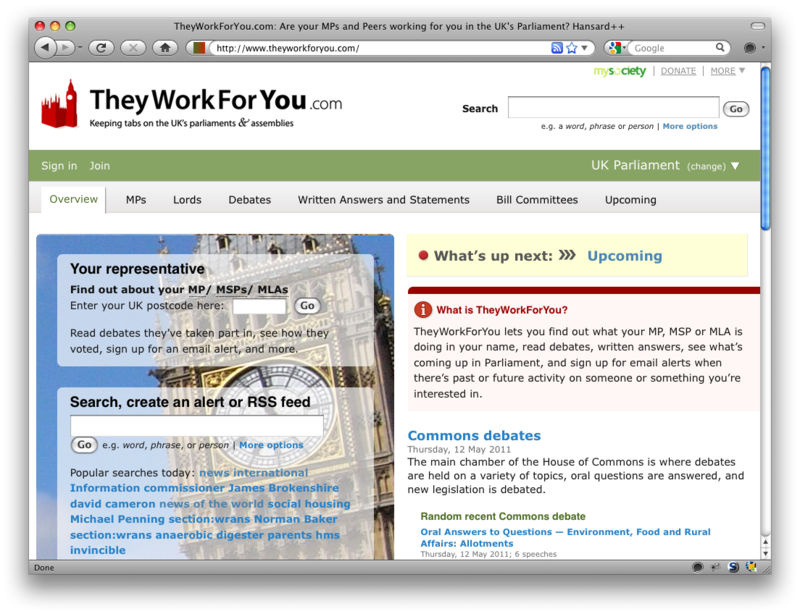 Since its launch in 2005, WriteToThem has always covered all parts of the United Kingdom, and the Northern Ireland Assembly was the first body added to TheyWorkForYou after the UK Parliament, in late 2006. So whilst we certainly have not ignored Northern Ireland, it had always been an irritant of mine (and a cause of infrequent emails) that FixMyStreet only covered Great Britain. This was due to the way it had originally been funded and set up, but those issues were in the past, due to a myriad of changes both internal and external, and it was now more a case of being able to find the resources to implement the necessary work. 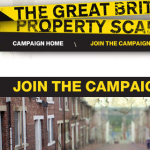 Late last year, mySociety worked with Channel 4 on the website for their series of programmes on The Great British Property Scandal. 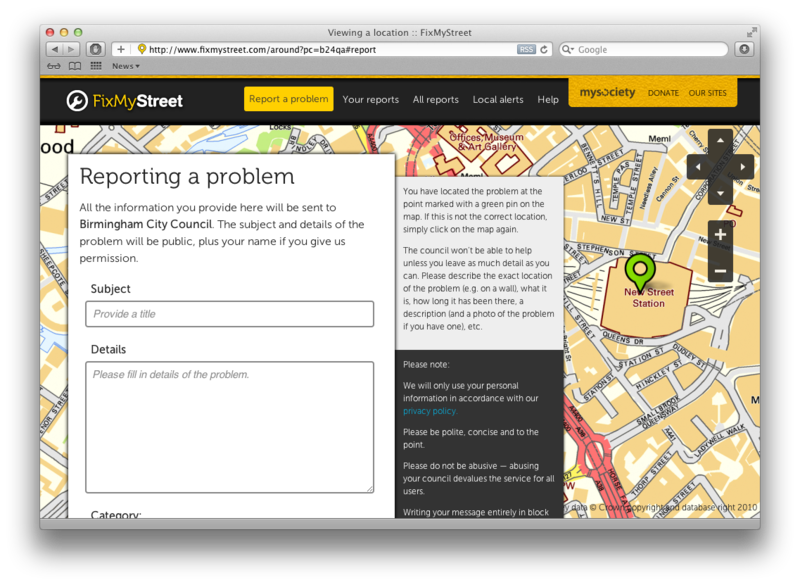 This used, in part, code similar to FixMyStreet to let people report empty homes, and it was required to work in all parts of the UK. So as part of that process, code was written or generalised that let aspects of FixMyStreet like the maps and place name lookup work for Northern Ireland locations. 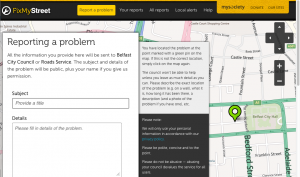 It’s taken a few months since then to allocate the time, but we’ve now been able to take the code written back then, add various other bits, and incorporate it into FixMyStreet – which now covers the 26 councils of Northern Ireland, and the central Roads Service. 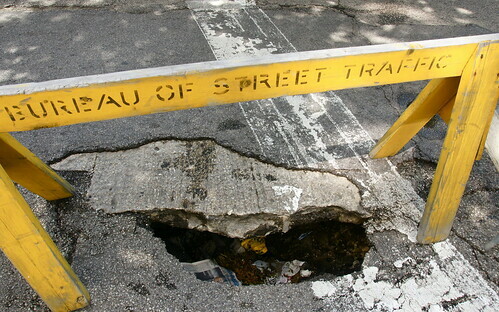 Issues such as potholes, graffiti, and broken street lighting can be reported to Antrim or Newry and Mourne as easily as Aberdeen or Wyre Forest, and just as in the rest of the UK you can sign up for alerts based around your location or to your council. 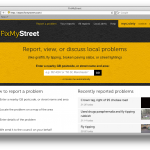 FixMyStreet, our site for reporting things like potholes and broken street lights, has had something of a major redesign, kindly supported in part by Kasabi. 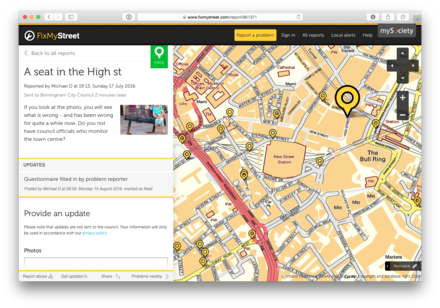 With the help of Supercool, we have overhauled the look of the site, bringing it up to date and making the most of some lovely maps. And as with any mySociety project, we’d really appreciate your feedback on how we can make it ever more usable. 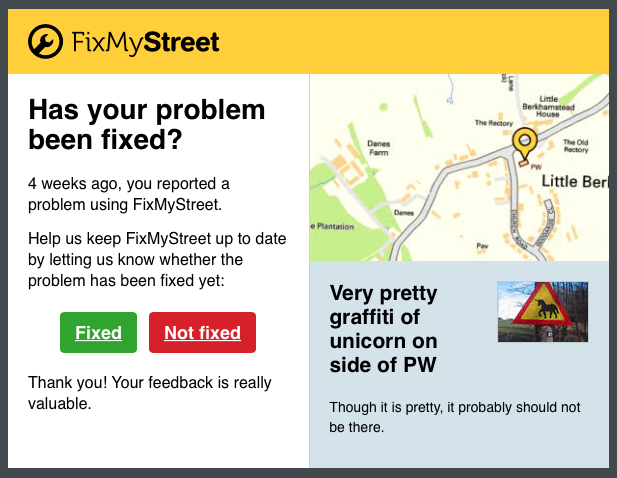 The biggest change to the new FixMyStreet is the use of responsive design, where the web site adapts to fit within the environment in which it’s being viewed. 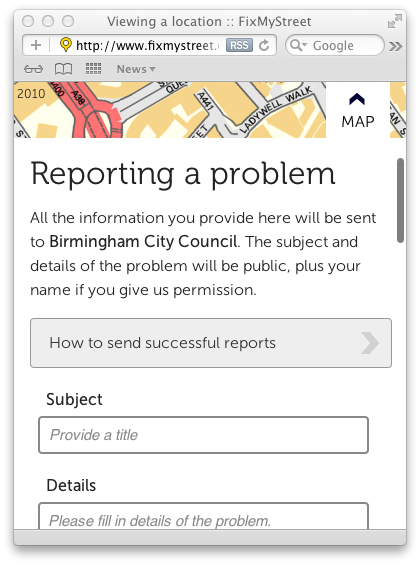 The main difference on FixMyStreet, besides the obvious navigation changes, is that in a small screen environment, the reporting process changes to have a full screen map and confirmation step, which we thought would be preferable on small touchscreens and other mobiles. There are some technical details at the end of this post. Along with the design, we’ve made a number of other improvements along the way. For example, something that’s been requested for a long time, we now auto-rotate photos on upload, if we can, and we’re storing whatever is provided rather than only a shrunken version. 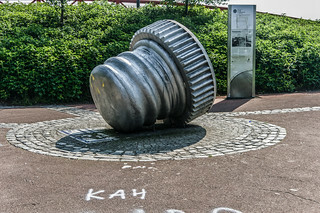 It’s interesting that most photos include correct orientation information, but some clearly do not (e.g. the Blackberry 9800). We have many things we’d still like to do, as a couple of items from our github repository show. 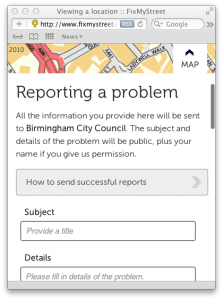 Firstly, it would be good if the FixMyStreet alert page could have something similar to what we’ve done on Barnet’s planning alerts service, providing a configurable circle for the potential alert area. We also are going to be adding faceted search to the area pages, allowing you to see only reports in a particular category, or within a certain time period. 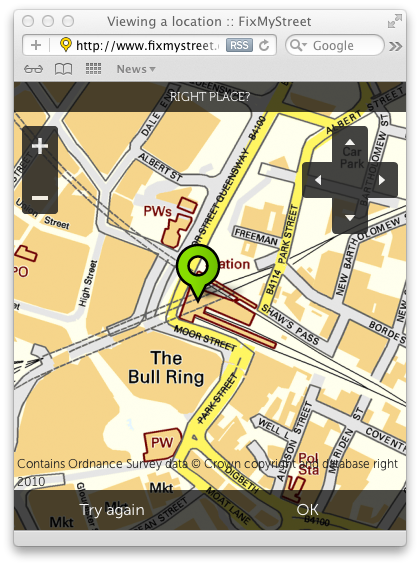 Regarding native phone apps – whilst the new design does hopefully work well on mobile phones, we understand that native apps are still useful for a number of reasons (not least, the fact photo upload is still not possible from a mobile web app on an iPhone). We have not had the time to update our apps, but will be doing so in the near future to bring them more in line with the redesign and hopefully improve them generally as well. As part of our new DIY mySociety project, we are today publishing an easy-to-read guide for people interested in using the FixMyStreet software to run versions of FixMyStreet outside of Britain. 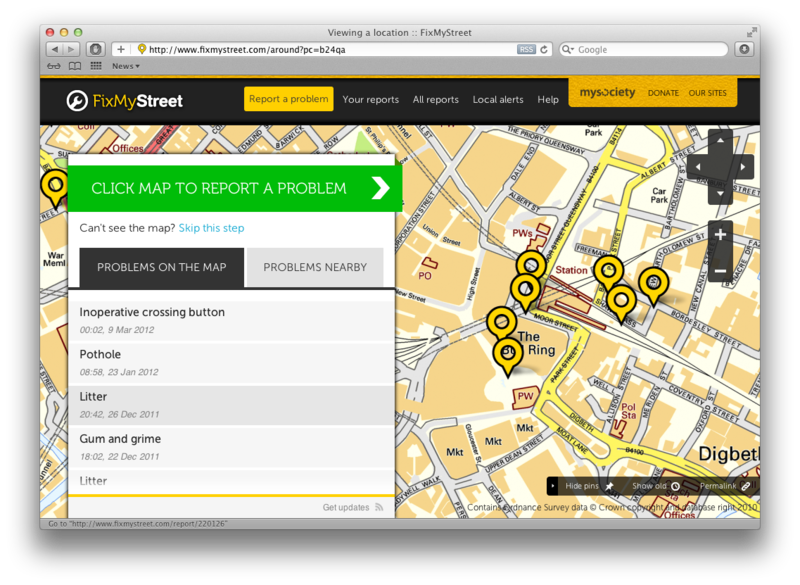 We are calling the newly upgraded, more re-usable open source code the FixMyStreet Platform. This is the first milestone in a major effort to upgrade the FixMyStreet Platform code to make it easier and more flexible to run in other countries. 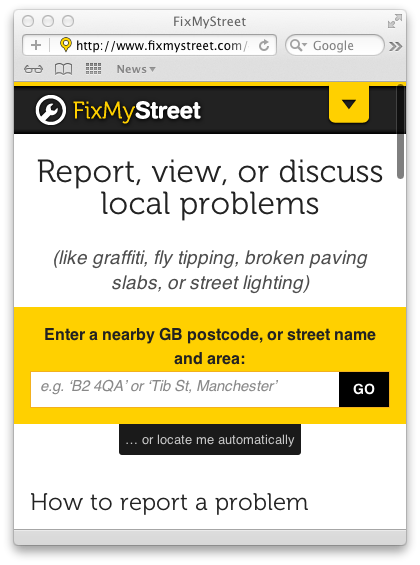 This effort started last year, and today we are formally encouraging people to join our new mailing list at the new FixMyStreet Platform homepage. 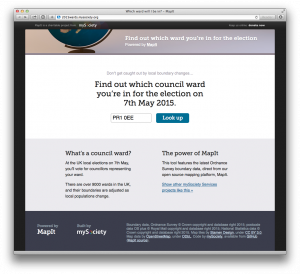 As part of our redesign work, we’ve spoken to a load of different councils about what they might want or need, too. 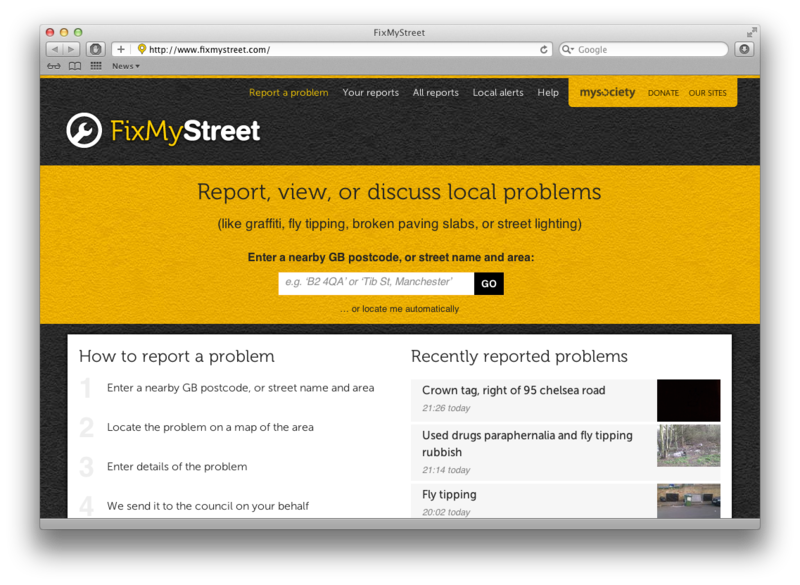 We’re now taking that knowledge, combining it with this redesign, and preparing to relaunch a substantially upgraded FixMyStreet for Councils product. If you’re interested in that, drop us a line. 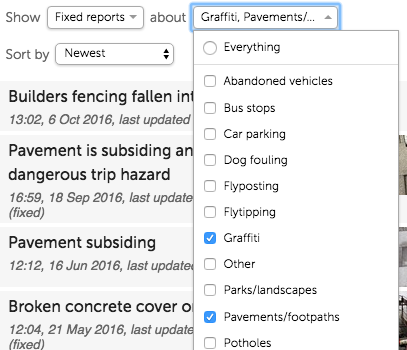 Finally, we are also now pushing details of reports entered on FixMyStreet to Kasabi’s data store as open linked data; you can find details of this dataset on their site. Let us know if it’s useful to you, or if we can do anything differently to help you. On a mobile, you can see that the site navigation is at the end of the document, with a skip to navigation link at the top. 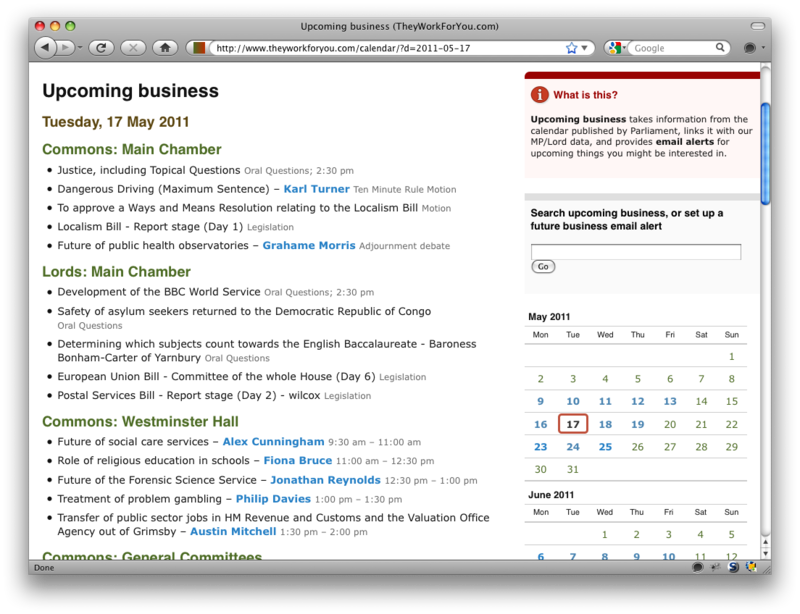 On a desktop browser, you’ll note that visually the navigation is now at the top. In both cases, the HTML is the same, with the navigation placed after the main content, so that it hopefully loads and appears first. We are using display: table-caption and caption-side: top in the desktop stylesheet in order to rearrange the content visually (as explained by Jeremy Keith), a simple yet powerful technique. If you have any technical questions about the design, please do ask in the comments and I’ll do my best to answer. 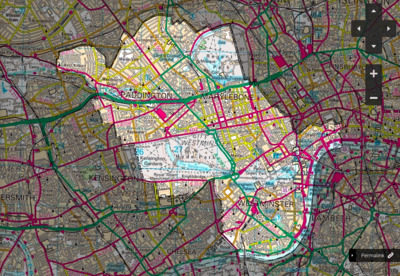 We investigated many different maps, and as I wrote in my previous blog post, we decided upon a combination of OS StreetView and Bing Maps’ OS layer as the best solution for the site. The specific OpenLayers code for this (which you can see in map-bing-ol.js is not complicated (as long as you don’t leave in superfluous commas breaking the site in IE6!) 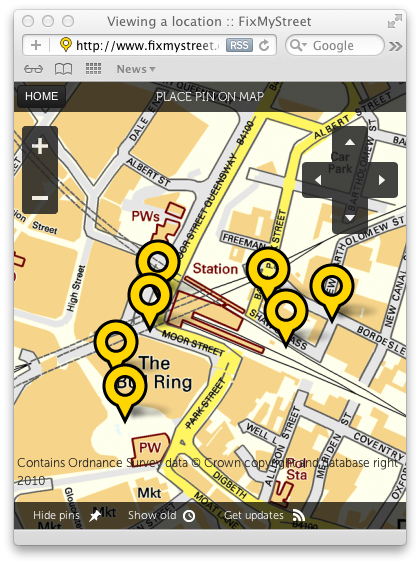 – overriding the getURL function and returning appropriate tile URLs based upon the zoom level. OpenLayers 2.11 (due out soon) will make using Bing tiles even easier, with its own seamless handling of them, as opposed to my slight bodge with regard to attribution (I’m displaying all the relevant copyright statements, rather than just the one for the appropriate location and zoom level which the new OpenLayers will do for you). I also had to tweak bits of the OpenLayers map initialisation so that I could restrict the zoom levels of the reporting map, something which again I believe is made easier in 2.11. Having pluggable maps makes it easy to change them if necessary – and it also means that for those who wish to use it, we can provide an OpenStreetMap version of FixMyStreet. This works by noticing the hostname and overriding the map class being asked for; everything necessary to the map handling is contained within the module, so the rest of the site can just carry on without realising anything is different. Things started to get a bit tricky when it came to being ready for production. In development, I had been using http://os.openstreetmap.org/ (a service hosted on OpenStreetMap’s development server) as my StreetView tile server, but I did not feel that I could use it for the live site – OpenStreetMap rightly make no reliability claims for it, it has a few rendering issues, and we would probably be having quite a bit of traffic which was not really fair to pass on to the service. I wanted my own version that I had control over, but then had a sinking feeling that I’d have to wait a month for something to process all the OS TIFF files (each one a 5km square) into millions and millions of PNG tiles. But after many diversions and dead ends, and with thanks to a variety of helpful web pages and people (Andrew Larcombe’s guide [dead link removed] to his similar install was helpful), I came up with the following working on-demand set-up, with no pre-seeding necessary, which I’m documenting in case it might be useful to someone else. MapServer is set up with a Shapefile (generated by gdaltindex) pointing at the OS source TIFF and TFW files, meaning it can map tile requests to the relevant bits of the TIFF files quickly and return the correct tile (view MapServer’s configuration* – our tileserver is so old, this is still in CVS). The OUTPUTFORMAT section at the top is to make sure the tiles returned are anti-aliased (at one point, I thought I had a choice between waiting for tiles to be prerendered anti-aliased, or going live with working but jaggedy tiles – thankfully I persevered until it all worked 🙂 ). As you drag the map around, you want the pins to update – the original OpenLayers code I wrote used the Markers layer to display the pins, which has the benefit of being simple, but doesn’t fit in with the more advanced OpenLayers concepts. Once this was switched to a Vector layer, it now has access to the BBOX strategy, which just needs a URL that can take in a bounding box and return the relevant data. I created a subclass of OpenLayers.Format.JSON, so that the server can return data for the left hand text columns, as well as the relevant pins for the map itself. 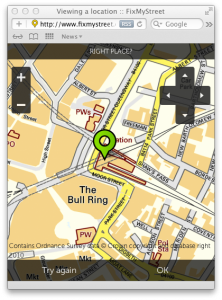 Note that also shows a new feature of MaPit – being able to ask for a simplified KML file, which will be smaller and quicker (though of course less accurate) than the full boundary.